197 pages | 50 Color Illus. 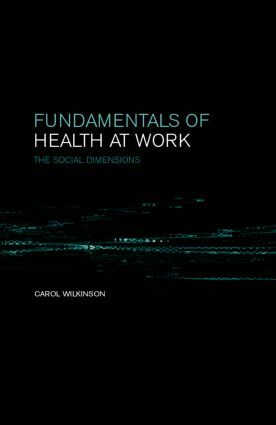 Fundamentals of Health at Work is an engaging re-assessment of workplace health, with particular emphasis on the neglected issues of the social context of the working environment and the impact on individuals of their workplaces. In looking at the historical context of the subject and at the concepts of health and illness, a selective series of thoughts emerge linking history, organizational development and health improvement. This text is comprehensive and unique in its multi-disciplinary analysis. It explores workplace health from its theoretical foundations and draws together the themes of occupational medicine, health and safety, workplace health development and occupational health. Acknowledgements. Preface. Introduction. Historical background. Concepts of work. Concepts of Health and Illness. Organisation of Work and Health. Psychosocial Approaches to Health at Work. Schools of Workplace Health Development. Workplace Health Promotion. Conclusion. Bibliography. Index. Senior lecturer in Health Studies at De Montfort University, UK.